Some of the hardest people to shop for are our elderly grandparents and great-grandparents. The respected family members members who probably don’t need or want much, but for whom we still want to do something thoughtful. Today’s post has both practical and special ideas that will mean so much on Christmas Day or for an upcoming birthday! Food Gifts – Consumable gifts are the way to go for people that have everything and may not have a lot of space for new trinkets. For someone who lives in a nursing or assisted living home, a scrumptious or savory treat might be a welcome change from the usual meal plan. This post has some of my favorite gourmet gifts to send and don’t miss our gourmet gift guide. Note: best to avoid hard-to-eat foods or sticky candies. Experience Gift – Plan an outing to the symphony, the art museum, or a sporting event. Take care of all the details (and write it down for them in a card). They will love spending time with you and have something to look forward to! See this post for more experience gift ideas. Potted Arrangement – Arrange it yourself, call a local florist, or order one of these beautiful potted arrangements. Another option: a subscription to the Plant Club through Harry and David. Or monthly flower delivery from a local florist. Digital Photo Frame – Nixplay frames make great gifts. Elderly loved ones may think they can’t work a digital photo frame but once you set it up they don’t have to do a thing! You send photos right from your phone (just download the app!). Family members love seeing new photos pop up. Artifact Uprising Easel – These easels are so elegant. Artifact Uprising prints high quality photos on thick paper to make beautiful pieces for your home. Simply upload the photos you want onto this website and create the calendar. Netflix Subscription – This is also a great gift for the grandparent who seems to have everything. Pair it with a Roku which makes it so easy to watch streaming channels like Netflix. Make a Donation in their Name – Donate to their favorite charity or cause or browse this website for ideas. In most cases, the organization will send them a card – or allow you to print a note – saying you made a donation in their honor. DIY Quote Book – Make a “99 Things We Love About” Book with Quotes from Family Members. If you have more time, order a box from Boombox Gifts. New Stationery and Stamps – Make it easy for them to write letters throughout the year with new stationery and stamps. Greeting Card Divider – This set ships free with Amazon Prime and includes the greeting cards. Large Print Books – Or an Audible subscription. Pair with a Kindle so they can easily listen to audio books. Cozy Cardigan – For women or men. Comfy Blanket – Barefoot Dreams, Ugg, or a Gravity Blanket. See this post for more cozy gift ideas. Slippers are always nice, too. Lightweight Magnifying Glass – Some might like a magnifying glass to read the paper. Silk Pillowcase – Spoil them with a luxury silk pillowcase. Bird Feeder – Such a great gift! This birdfeeder is pretty and practical. Don’t forget the food and maybe some binoculars! Bubbling Foot Bath– Everyone loves a good foot soak! Lots of options on Amazon. Calendar with Family Photos – Shutterfly or Walgreens if last minute. Gift Card to Favorite Restaurant – Make sure to set a date to take him or her so they have something to look forward to! Sodoku Book – Lots on Amazon as well as Crossword puzzles. At Home Main/Pedi Gift Card – This is a great option for someone that can’t drive. 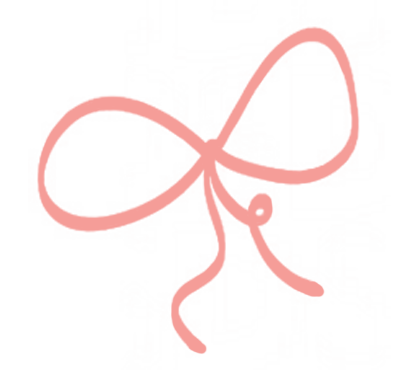 Cherry in Dallas offers manis/pedis in home and Birdie offers blowouts in home. Such a great gift for someone that can’t or doesn’t leave home often. If they live in a nursing home, maybe a gift card to the on site beauty parlor! Large Digital Clock – This clock is great for someone who is losing his memory and worries about what time it is. It tells the day and time and is large and bright! Tumbler – A skinny tumbler is a great reminder to keep hydrated. Gift Card to Local Pharmacy – Or to whatever store they visit often. Ancestry Kit – Might be fun for them to learn more about their ancestry with a 23 and Me Ancestry Kit. Pretty disposable plates and napkins – A pretty floral pattern or something they will enjoy using but won’t dress about cleaning. Echo Dot – Easy to use! They might enjoy asking Alexa questions, listening to the news, or having it play their favorite music. DIY scrapbook About Your Family Members – This may be helpful for someone with memory loss. A page for each family members with photos, fun facts, and why he or she loves the gift recipient. The #1 Selling Hand Cream in the World – Find nice gift sets here. A legacy book – A journal or book that allows them to write down stories and wisdom they want to pass down to future generations. Remember, a card or letter telling them how much you love them is probably the best gift of all! 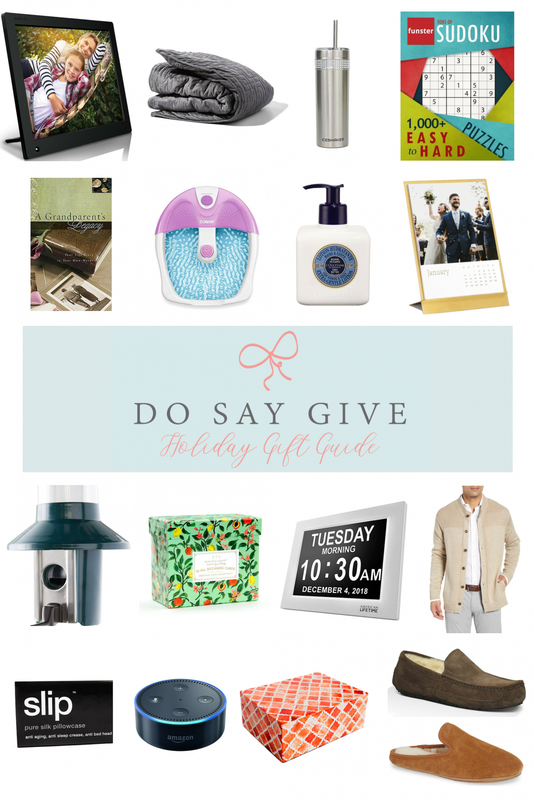 Browse DoSayGive’s Holiday Gift Guide for more great ideas for everyone on your list. Pin this post so you can remember throughout the year! Thank you for this! You’re exactly right–we love and respect them and want to get them something nice, but they’re hard to shop for. These are some great ideas.